PSO has the leading edge in aviation business of the country with an experience of more than 03 decades in fuelling aircrafts, having market share more than 75% in Jet Fuel. 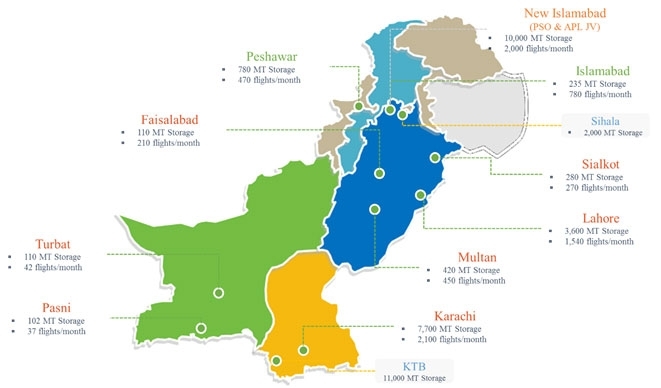 PSO has extensive operations across 9 major airports throughout Pakistan. In keeping with our commitment of fuelling the country’s growth; we ensure that all of our products and services maintain the highest standards in quality. Aviation function operates under an organization approval issued by the Civil Aviation Authority (CAA) of Pakistan for storage & distribution of Jet A-1 fuel. The approval requires compliance with civil aviation rules, air-navigation orders and is renewed every year. CAA Pakistan carries out regular periodic audits of aviation stations. At PSO, we continually meet and exceed consumer expectations by adhering to global quality standards and constantly improve our services and products by investing in research and development, conducting routine audits and implementing performance reviews to ensure customer satisfaction. We follow the “Ramp Safety” requirements stipulated by CAA Pakistan and written in the Air Total International Quality Control and Operation Manual. Safety trainings and rehearsals are regularly carried out at airports. Aviation & Marine department has a technical and strategic collaboration with the Air Total International (ATI France). ATI conducts annual inspections to ensure that products and services are at par with globally set industry standards. Air Total International offers its global expertise by assisting and supporting PSO in operations such as handling and distribution of aviation fuel. Hydrant Servicers, manufactured on latest refueling, filtering and interlocking technology serves aircrafts at hydrant bays, designed in accordance with the latest issues of NFPA Standards and ATEX Directives, IP Model Code of Safe Practice & JIG recommendations. Refuellers provide service to aircrafts at apron where underground hydrant lines are not available. The refueling equipment is loaded with safety features and interlocks that prevents damage to the aircraft, internal arrangement of equipment, product spill and harming people and adjacent enclaves. Jet Fuel (Jet-A1) supplied by PSO conforms with the latest issues of Defense Standard 91-91 and ASTM D1655. These requirements are summarized in the latest issue of the “Aviation Fuel Quality Requirements for Jointly Operated Systems”, also known as the AFQRJOS or Joint Checklist. 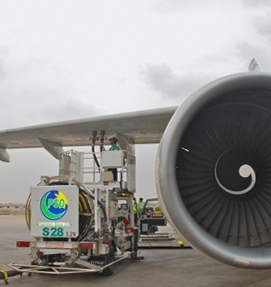 BPTO 2380 is one of the most widely used turbine oils in the commercial aviation industry. It has been found to neutralize the effects of Copper (Cu) – with superior metal passivation results showing reduced oxidation and sludge formation. The New Islamabad International Airport Pakistan (NIIAP) is the largest airport of Pakistan, capable of handling new generation aircrafts including one of the biggest aircrafts, Airbus A-380. One of the core features of the airport is the state-of the art Fuel Farm Facility which is equipped with technologically advanced refueling equipment, electrical systems, automation, safety and security systems and robust mechanical & civil structures. The hydrant refueling system of NIIAP is the largest airport refueling system of the country. The refueling system has a 14 km hydrant line of 14 inch diameter with 55 hydrants pits to fuel aircrafts round the clock. The Fuel Farm Facility is the largest airport farm in the country covering an area of 12 acres. The facility is compliant with local and international standards including JIG, NFPA, API as well as CAA for the receiving, storage, filtering, pumping and testing of aviation fuel. The facility is also furnished with a smart refueling system comprising of automation, safety interlocks, automatic detection & response and quality control features. Fuel Dispensing System (Pump House, MCC Room, Standby Generator Room). Test Rig (for fuel flushing and calibration).